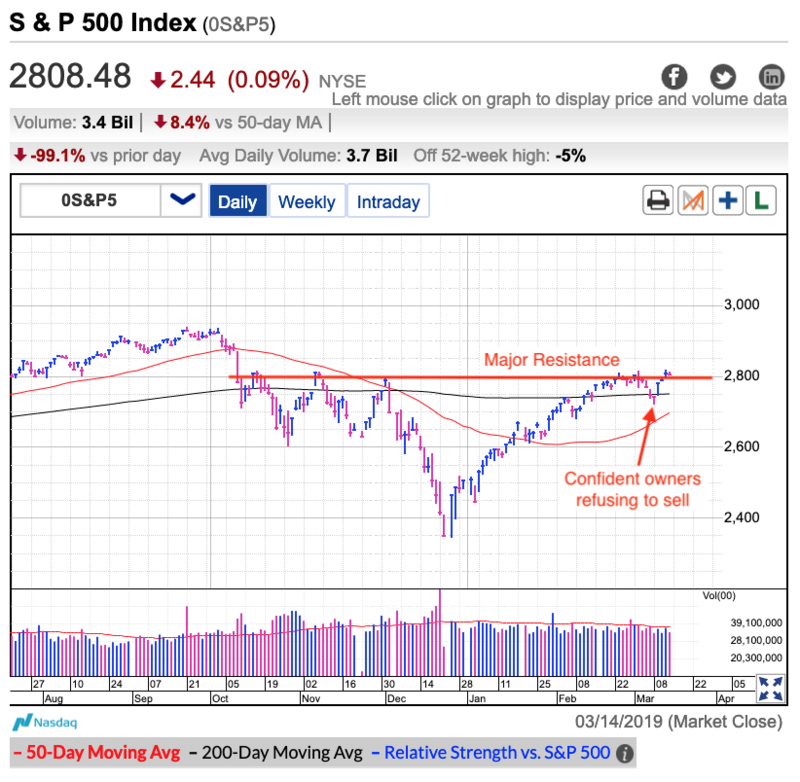 The S&P 500 slipped a trivial amount Thursday, but more crucially, it held above the psychologically significant 2,800 level. This marks only the 3rd close above this milestone since early November and shows the market continues recovering from December’s brutal tumble. As it turned out, Bulls won the battle and prices closed well above the early lows. That bullish reversal was the start of this week’s strong rebound. That was the signal for dip buyers to jump in and for shorts to lock-in profits and get out of the way. Sign up for FREE Email Alerts to get profitable insights like these delivered to your inbox. But that was then and this is now. What you really want to know is what comes next. Last week’s dip was the perfect setup to trigger a bigger selloff if that is what this market was inclined to do. We’ve come a long way since the December lows and a pullback is a normal and healthy thing to do following such a strong move. But rather than use the excuse to lock-in profits, most owners stood their ground and refused to sell. What the market is not doing is almost always more insightful than what it is doing. Last week the market refused to accelerate lower. Confident owners didn’t fall for the second-guessing and no matter what is going on around us, when most owners refuse to sell, prices find a bottom and bounce. Move forward several days and while Wednesday’s lethargic break above 2,800 resistance was uninspiring, the important thing is we held this key level through the close…and then again Thursday. Prices tumble from unsustainable levels quickly and two closes above a significant milestone is a notable accomplishment. Refusing to breakdown last week and holding above support this week are two significant accomplishments and definitely give the upper hand to bulls. What this means going forward is that if bears want to break this market, it will take something even more significant than what we saw last week. Headlines have been far from great. European and Asian economies continue to slow. Trump’s negotiations with the Chinese are bogging down. Even the robust U.S. economy is slipping as last month’s employment missed the mark by a mile and other economic data was disappointing. All of these headlines were perfect excuses for the market to keep tumbling lower. Yet here we stand, within a few points of six-month highs. If the market doesn’t care about these things, then neither should we. This week’s muted reaction to reclaiming 2,800 shows this market lacks explosive upside, but the path of least resistance remains higher. The going will be slow, but expect higher prices over the near- and medium-term. While we always run the risk of being blindsided by the unexpected, it will need to be far larger than anything thrown at us thus far if it is going to derail this rebound. That said, slow means lots of back and forth. Some days will be up, some days will be down, but the up will be a little bigger than the down. The only thing we need to fear is a shockingly bad headline that sends prices tumbling under 2,800 and the losses accelerate after that. A routine dip under 2,800 that bounces hours later is nothing to worry about. In fact, bouncing quickly would be yet another bullish sign that this market doesn’t want to sell off. A market that refuses to go down will eventually go up.